Perfect for anyone who loves to read! Keep several of these bold and beautiful fine-art bookmarks handy — ideal for novels, cookbooks, textbooks and more. 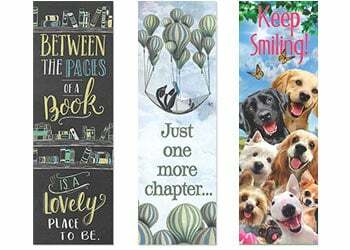 Featuring cute, funny, Christian, and other fun bookmark themes, they also make thoughtful gifts for the book lover, chef, or student in your life! Buy 3 Bookmarks and get 1 more Bookmark FREE! Any combination!